Click Homeless - We fight homelessness by teaching Internet skills. What's the first thing a homeless person needs? A job, food, cash, prayer, a house, a hug, an ear? Let's start by teaching the power of the Internet, where you can build community, knowledge and wealth. A library or community computer lab is usually a walk or bus ride away and it can unlock so much with a bit of direction. In Nashville I teach a weekly computer basics class at Room in the Inn. Join a class! We start by signing up everyone for an email address (your passport to the Internet), then we teach other essential Internet skills. Currently I only teach a weekly class, but I've been working on something bigger. It will need community support to pull off. Follow us on Twitter or Facebook to learn when we are ready for a project that could use your help. Click Homeless was established in 2008. 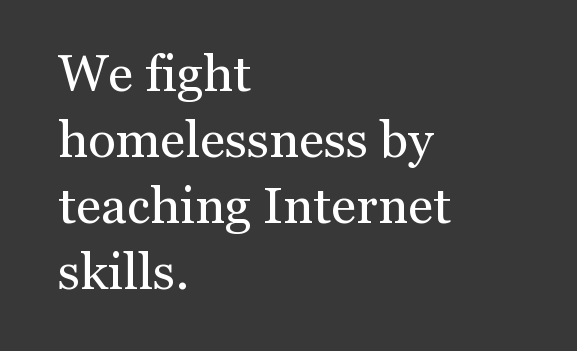 We fight homelessness by teaching Internet skills.